It is a reversible fabric which can make the wearer feel warm or cool, depending on which side of the fabric is facing the body. Heating and cooling of homes in the United States take up about 40% of all household energy consumption. This energy consumption causes a bulk of global CO2 emissions, aggravating global warming and climate change. Now, what if we had clothes that could control temperatures without any energy consumption and burning of fossil fuels? A team of engineers at Stanford University have invented a fabric that can do just that — make you feel warm in winter, and cool in summer. It is a reversible fabric, which either warms or cools the wearer depending on which side of the fabric is facing the body. The warming works by trapping the heat our bodies generate and radiating it inwards, towards the body, increasing its temperature. The cooling works by absorbing the body’s heat and radiating it outwards, away from the body, into the surrounding air. This works because of the materials used in the fabric, and how they are placed. The fabric is made from polyethylene - a type of inexpensive plastic. This polyethylene (PE) has nanometer-sized holes, which allow the heat generated by the body to pass right through. 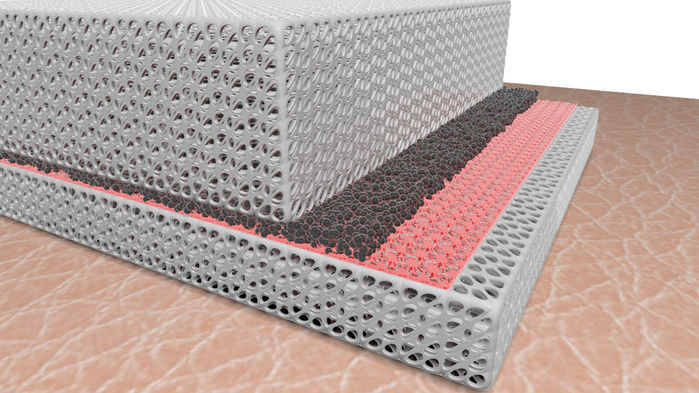 The nano-PE used is covered on one side with black carbon, and on the other side with an ultrathin layer of copper. Carbon absorbs and emits body heat, while copper can only weakly absorb and emit it. When the fabric is worn to cool the body, the carbon layer is on the outside. So whatever heat the body generates is absorbed by the carbon, and emitted out into the atmosphere, cooling the wearer. When the fabric is worn to warm the body, the opposite happens. The copper, which does not emit much radiation, does not allow any heat to escape outside. And whatever heat the fabric does absorb is radiated back towards the body, warming it. This technology can create a difference of 6.5 degrees Celsius, the team led by Yi Cui reported in Science Advances. This difference can be doubled by further improvements. This means, in areas that require moderate temperature controls, the use of air conditioners can be possibly completely eliminated if people were to wear clothes made out of this fabric. In areas with more extreme temperatures, the thermostats can be set closer to atmospheric temperatures, reducing energy consumption. The additional work in keeping humans comfortable will be done by their clothes, which will not add to CO2 emissions. This fabric does not require any external energy to do its job, which should make it easier to maintain. The team has begun work on commercialising their invention, with plans to hit the market in the next few years. The fabric will still have to solve other issues, such as be durable and washable. Rains in the Greenland are enhancing the cascade of arctic ice sheet melt and sea level rise.